Last weekend saw the season finale for the Group C/GTP series with a 16 car entry for the double header at Dijon-Prenois in some glorious French sunshine. Following a tentative free practice on a damp track on Friday afternoon, the qualifying session on Saturday had David Mercer (C1 Spice) in a fabulous time 1:12.208 ahead of Chris Randall (Nissan NPT1 GTP) and a trio in the 1:17s of Richard Eyre (Porsche 962), Jim Mullen (GTP Spice) and Gary Pearson in the indecently quick, ADA Cosworth DFZ (Class 2 C2), and the hard charging Andrew Smith in the first of the two Ecosses, leading class 4! Alas Mercer’s car had problems with the scavenge pumps and did not make the start, although they repaired it for Race 2. Race 1 (40 minutes) – Chris Randall went straight into a lead that was never challenged but Richard Eyre and Gary Pearson were having terrific scrap for 2nd with Pearson almost running under Eyre’s wing. Alas this dice ended when Pearson had door glass failure and had to retire leaving Mullen perfectly placed to take 3rd at the flag after a great drive and fastest lap of 1:16.389s. See Race 2 for an interesting take on the Pearson/Mullen race story! The Ecosses of Andrew Smith (Cosworth) and Alasdair McCaig (Rover) had a crowd thrilling race with McCaig getting passed Smith on the opening lap and holding onto the ‘lead’ until the end, although Smith had backed off due to a slow puncture, nearly being caught by Richard Oddie in the GTP Argo. Real nose to tail stuff for over 20 laps as were the Mazda of Jim Loftis and the Bardon of Duncan McKay. The final overall result was Randall, Eyre and Mullen. Class winners: Randall and McCaig. Fastest lap: Jim Mullen 1:16.389 (179.187kph). Race 2 (40 minutes) - With the track now a bit warmer on Sunday afternoon, Gary Pearson was now in Jim Mullen’s GTP Spice (as the ADA could not be fixed in time and a flight mix-up resulted in poor Jim Mullen on his way back to the USA)! So a start from the back of the grid for Gary and Mercer in the late repaired Spice. Fireworks were in prospect! Meanwhile at the front of the grid Chris Randall looked all set for win number 2 but motor racing isn’t like that!! By the start of lap 2 Pearson was in 3rd and Mercer 4th!! Alas, lap 4 resulted in engine failure for Mercer and Pearson went after Eyre running in 2nd and passed him on lap 8 only for poor Randall to blow the Nissan engine and suddenly Pearson was leading, setting a fastest lap of 1:14.545 (164.067kph)!!! 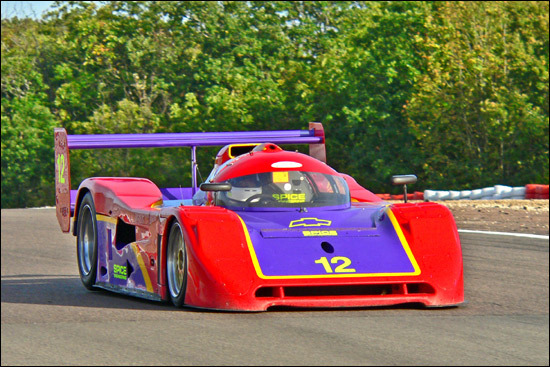 Not bad for his first race in the Chevrolet engined GTP Spice, and thrilling owner Jim Mullen, who was now in the airport! McCaig had again got in front of Smith in the Ecosse by the end of lap 1 only for Smith to get back in front by lap 4 and they ran ‘as one’ for another 5 laps until McCaig’s brand new engine expired (much to the disappointment of father Hugh McCaig, watching on the pit wall!). Oddie, in the GTP Argo, watched all this excitement to finish 4th and the three, non Ecosse, Class 4 cars of Loftis (Mazda), McKay (Bardon) and Bateman (Tiga) behind him continued their scrap to the flag. The final overall result: Gary Pearson, Richard Eyre and Andrew Smith.